As a dedicated estate planning and asset protection planning law firm in NJ, we frequently credit our clients with the longstanding reputation we have earned in the area. We know that your planning needs are important to you and it’s always been our goal as a firm to meet and exceed your expectations. Whether we’ve just met you or have been working with you for years, it’s our mission to serve you personally and help to suggest strategies and tactics most aligned with your individual needs. 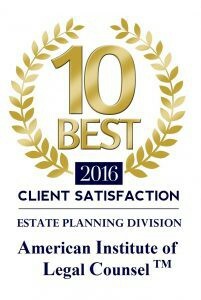 That’s why we are so thrilled to have been named as one of the 10 Best in the Estate Planning Division by the American Institute of Legal Counsel. While the long relationships we have with our clients, the referrals to others, and the thanks we receive from clients like you are our favorite part of business, being awarded from an outside party also carries its own excitement. We hope to continue to serve you and your families with the same compassion and vigor we’ve come to be known for since founding this office. It’s truly a privilege to get to work with all of our wonderful clients in New Jersey and we hope to continue to be part of your estate planning process for many years to come. Thank you for making what we do so enjoyable!